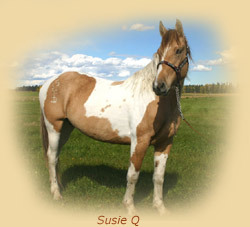 The Spotted Draft horse is the result of breeding certain draft breeds with other acceptable lighter bodied breeds to obtain the pinto coloring in a horse with the look of a draft. One of the first recorded Spotted Draft horses is believed to have been a Drum horse in the court of Queen Elizabeth 1. 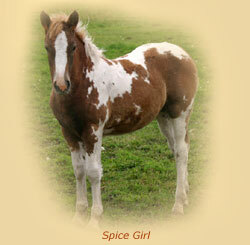 Draft cross horses have been used throughout history for a variety of purposes. Bred for their even temperaments and willingness to work, these horses have worked alongside their masters in a number of occupations as diverse as the cultures in which they have thrived. In ancient Russia, draft cross horses packed the trapper’s fur pelts. Along the shores of the Netherlands, they pulled nets filled with fish from the sea. In America, the draft cross horse plowed the fields of the Great Basin and played an important role in the construction of our nation's railroads. Across the continents, draft crosses have served as riding and carriage horses for aristocrats and royalty. Migrating settlers harnessed them to pull their wagons and pack supplies. The draft cross horse was an integral part in the establishment of new settlements across Asia, Europe and America. In the Medieval period, draft cross horses were decorated in armor and carried men off to war. This was the time of the famous caballeros, monastic knights who were skilled horsemen, admired for their ability to train horses in the art of battle. The evolution of this training passed down through the centuries is what we now know today as the art of classical dressage. 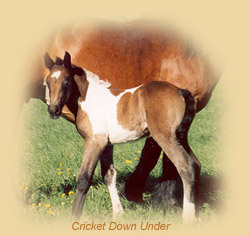 The Spotted Draft is a draft cross horse that should have conformation closely reflecting the draft type it most resembles. According to the North American Spotted Draft Horse Association (NASDHA), acceptable draft breeds that may be used as a foundation for the Spotted Draft are the Percheron, Belgian, Clydesdale, Suffolk and Shire. Appaloosa, pony, donkey, mule, gaited horses, saddlebred or Gypsy Vanner/Irish Tinker breeds are not permissible for cross-breeding. The breed standard states that "generally the frame should be large, supported by clean, dense bone. The forearms and thighs should be short, strong and muscled and the legs should be placed well under the horse. The horse should have an intelligent looking head with active ears. The neck should be arched, powerful and clean cut at the throat. Shoulders are usually more upright than in other breeds, suitable for power more than action. The back is short and strong and the ribs spring high from the backbone. The hindquarters are long and smooth to the root of the tail. 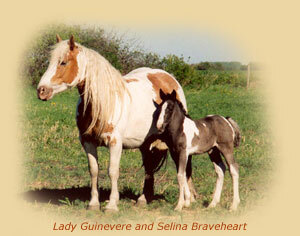 The tail springs from a point that is higher on the hindquarters than most other breeds. The hipbones are wide apart, smoothly covered and the croup is normally level. Depth and thickness from the withers to the legs are essential and they should be as deep in the flank as over the heart." Today, people enjoy Spotted Draft horses in a variety of pursuits. 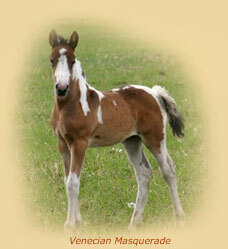 They are used for agricultural work, pleasure driving, showing, parades, trail riding and as commercial carriage horses. But most of all, with their sweet temperaments, natural curiosity and willingness to learn, they make terrific companion horses.